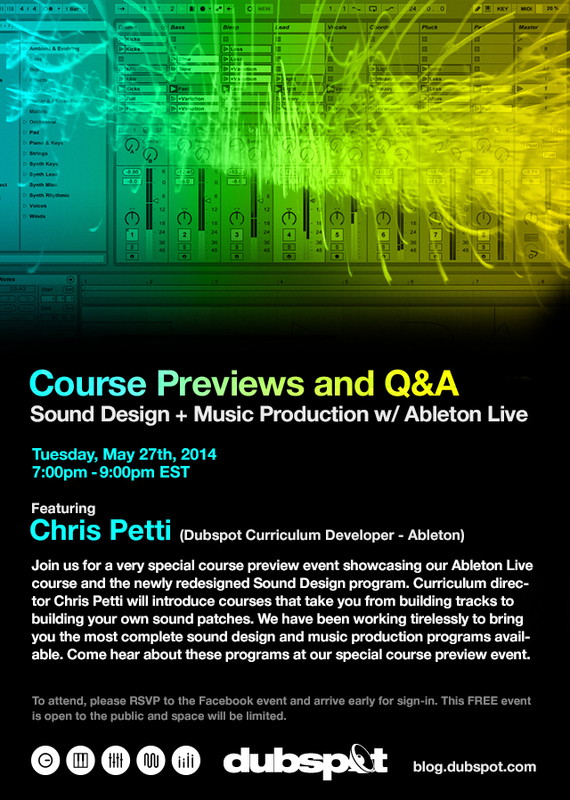 On Tuesday, May 27th we present a special course preview event at Dubspot NY with curriculum director Chris Petti who will introduce our music production and recently revamped sound design courses. Join us on May 27th at our New York location for a very special course preview event showcasing our Ableton Live course and the newly redesigned Sound Design program with curriculum director Chris Petti. Ableton Live is one of the most powerful and popular DAWs available and we have a comprehensive program that will help you find success with your productions. When you’re ready to dig deeper, come learn to program your own patches. Our new sound design course is the perfect compliment to your production skills and will teach you how to sculpt sounds from scratch. We have been working tirelessly to bring you the most complete Sound Design and Production programs available. Come hear about these programs at our special course preview event. To attend, please RSVP to the Facebook event and arrive early for sign in. This FREE event is open to the public and space will be limited.